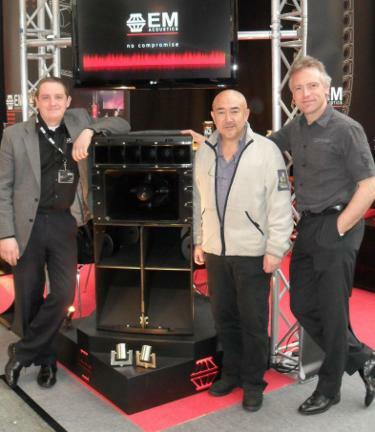 UK professional loudspeaker company, EM Acoustics, announced the appointment of Tom Lee Engineering in Hong Kong as their exclusive distributor for Hong Kong, mainland China and Macau at Prolight+Sound 2011, Shanghai. The deal was formalized after nearly two years of discussion with TLM and extensive product testing. EM Acoustics’ international sales manager, Alex Schloesser, is pleased to see that the negotiations have now borne fruit and that TLE have taken delivery of a significant EM Acoustics inventory including six X3 high-Q array enclosures plus flying gear and twelve MSE-118 Quake subs as well as a selection of smaller products.